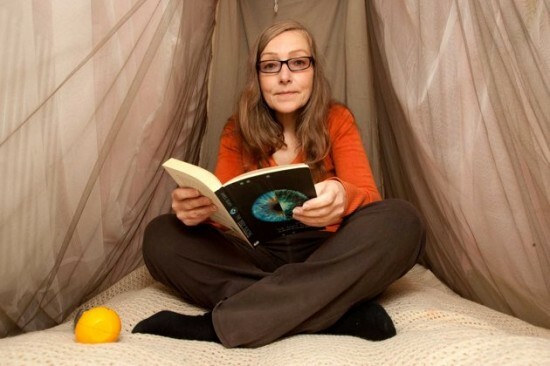 A British woman spends up to 18 hours a day in her homemade Faraday cage, because she is allergic to electromagnetic fields. 51-year-old Velma, from London, England has to wear a special scarf that protects her from electromagnetic waves when she leaves the house. According to reports, Velma first discovered she suffered from Electromagnetic Hypersensitivity Syndrome (EHS) in her teenage years. it came after she suffered a shock when she touched the switch of an electric fire in her bathroom. For a while she barely noticed the symptoms and even worked as a secretary for a number of companies, where she operated a computer. “Even back then I could feel a huge agitation when using the computer, but I thought it was just because I didn’t have the technological skills,” Velma remembers. Although it is believed previous shocks make people more susceptible, the rare condition really started to affect her after the introduction of 3G technology. Nowadays she has unbearable head and nerve pain, memory loss, tinnitus, heart palpitations, vertigo and aching joints every time she’s close the technology, so she spends most of her days in a Faraday cage she built herself, reading, writing and sleeping. “We desperately need a white zone — an area where there’s little or no emissions — where we can go to relax and recuperate,” the woman says, but the problem is EHS is currently only recognized as a medical condition in Sweden and Spain. She’s been to a physician countless times, asking for tests, but every time she was told there are people out there with bigger problems than hers. The numbers may increase in five years where up to 50 percent of the world’s population could be affected at current exposure levels.